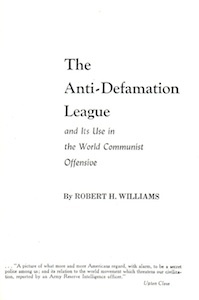 What is Anti-Defamation League? The full name of the group is “Anti-Defamation League of B’nai B’rith.” To start at the end first, B’nai B’rith (Hebrew for “Children of the Covenant”) is the oldest and largest American fraternal lodge for Jews only. It was founded in 1843, called ‘purely an American institution.’ (“B’nai B’rith represents Jewry throughout the world” – B’nai B’rith magazine, July, 1937, p. 352, quoting Ludwig Lewisohn). Many of its lodges sponsor forums or other active discussion groups on the problems of the day and cultural matters. An organization of similar name and purpose to the Anti-Defamation League existed in Germany and border European countries during the years following WWI. It’s stated purpose was to stop and prevent the growth of anti-Jewish feeling among the defeated German people, who tended to look for a scape-goat for their humiliation, and resented the activities of citizens of Jewish name and connections during these hard years. It’s methods were such that it probably aggravated, instead of discouraged, ill-feeling. Some who are now American citizens (refugees from Hitler), say that, for this reason, they parted from the Anti-Defamation League of this period in Germany.